Globally, mobile technology alters the way individuals and groups conduct their day-to-day activities. It impacts on business, culture and society, as it changes the way people communicate, do business, socialise, and has considerable effect on its user’s perception and attitude. This chapter reviews and explores mobile technology growth in the Gulf region with particular focus on the use of mobile phones in the UAE. It further explores, through a snapshot survey, people’s perception, attitude, and possible implications of the technology on their behaviour. Based on the review and results of the survey we conclude with a discussion, recommendations and suggestions for future research. Mobile phones were originally created for business use for adults (Aoki & Downes, 2003). 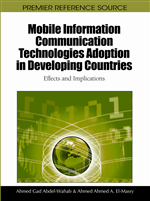 The growth of mobile phone technology was realised in 2002 through the increase of the number of mobile phone users worldwide, over those of land-line phone users (Srivastava, 2005). Mobile phones alter the way people conduct their daily activities with extensive implications on different cultures and societies, due to changes in the nature of communication, implications on people’s relationships, and effects on economic activities as well as users’ perceptions of themselves and the world (Plant, 2002). Gender difference is another factor that may affect mobile phone’s usage. For example, older female teens lag behind males in the ownership of mobile phones (Ling 1999). Also, males differ from females in terms of mobile phones’ usage. For example, males are more interested in downloading games, while females are more interested in downloading ringtones (BBC News, 2004a). According to a survey by market research firm JD Power and Associates, spending on mobile phones has increased, reaching £45 (USD 72) a month, including for example text, voice and other phone services (BBC News, 2004b). Mobile technology impacts on young people’s peer groups making possible a “truly networked society” as well as on family relationships (Campbell, 2005). Further, the ubiquity of mobile phones, and integrated features, such as Web browsers and the Java platform, represent important basis for mobile learning (Kreutzer, 2008) and mobile marketing (Leppaniemi and Karjaluoto, 2008). However, some schools and educational institutions argue that the use of mobile phones can have negative effects in terms of disrupting teaching and reducing students’ attention in class (Campbell, 2005). This is in addition to its negative effect as a plagiarism tool for cheating in examinations (The Guardian, 2006). Furthermore, increasingly, members of modern societies are assuming the role of technoverts, “a method of using mobile technology to insulate themselves from human interaction” (Randall, 2008). Traditionally, for example, at universities, students are commonly seen in pairs or groups discussing various issues and interacting with their peers and lecturers, but, this is gradually disappearing. Students are increasingly occupied with their mobiles, either texting others, checking messages, listening to music or calling others. The lack of face-to-face interaction in a public environment, lack of eye contact and weaker social bonding seem to have become the norm. This is in addition to health effects (Telegraph, 2008), road safety issues (ROSPA, 2007), security and culturally related concerns, for example, possible implications and consequence of using the Blackberry technology (The National, 2010; Gulf News, 2010).